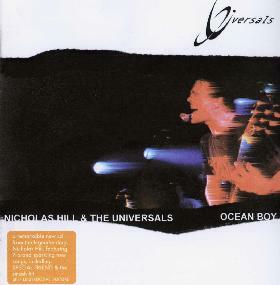 Nicholas Hill and the Universals - "Ocean Boy"
Nicholas Hill has had a very long and interesting journey in music. I was fortunate to receive a CD from 1999 and the latest from his band, Ocean Boy. The band is a 6 piece with guitar, bass, drums, male and female vocals, keyboards and sax. The first CD from 1999, is a great piece of psychedelic rock with some space due to the way Nicholas plays the delay guitar. It opens up the sound and makes it more spaced out. Anyway what about the new release? The title track, "Ocean Boy", begins the CD with a dark moody piece lounge jazz piece. Don't be thrown off as the psychedelic rock is back with "GlassSkyscraper", with its deep bass line and strange sounds layered over the top of the phased out guitars. The track ends just as it seems they are starting to head out to space out. "Tell Me About It" has a nice delay guitar and reminds me a bit of some of the 1992-94 era Sundial or Magic Mushroom Band stuff. Nicholas sings in a very laid back style, a bit of David Bowie in there sometimes. "Special Friend" is something totally different. This is a pop song with a very laid back groove and some spacey sounds layered over the top and some nice saxophone. "No Only Way" is another space-lounge jazz type thing. "Interlude" begins with some really great sax and a mellow start as they head into "Self Destructive Nature" which has a bit of an ethnic feel and ska nature to it, and is the only track on the CD to really ROCK. It is a really excellent composition. Overall, a pretty good release but not as much ROCK and the psychedelic nature of the previous release is toned down a lot. For more information you can visit the Nicholas Hill and the Universals web site at: http://www.theuniversals.com.